The second area on which the HRW report concentrated was attacks on hospitals. I pointed out at the time that the laws of war relate first to recognized hospitals, not buildings suddenly declared makeshift hospitals, and also that the LTTE used these buildings also for offensive weaponry. Trying to deal with attacks from such is not only acceptable, it is essential in a context in which delays would only increase the suffering of the people the LTTE was holding hostage. I also pointed out the exaggeration the LTTE engaged in with regard to what they presented as attacks on hospitals, one example being the report of the US State Department that the Puthukkudiyirippu Hospital did not seem ‘to show visible damaga and appeared to be functioning’ according to satellite imagery of January 28th, even though there were several reports of it being attacked earlier in the month. It is noteworthy too that the pictures attached to the Darusman report, while showing signs of shelling, suggest that the hospitals themselves were not targeted. Had they been targeted, there would have been little or nothing of them left. I responded again at length with regard to this question of attacks on hospitals after reading the Darusman Panel Report, pointing out that, even if they believed everything they set down, without comparing it with what was cited in previous reports, they had no grounds at all for claiming that there was systematic shelling of hospitals. I also explored all allegations of attacks on hospitals made by Tamil Net during the entire period of hostilities in the North, and was able to show that there was obviously no policy of attacking hospitals, though hospitals did suffer damage as the LTTE began as a matter of policy to concentrate weapons near hospitals, as the Panel records, if not actually in them. Unfortunately government failed to respond to the relatively sober manner in which the US State Department noted various allegations in a Report issued towards the end of 2009. The source for these allegations, several of which related to hospitals, was Human Rights Watch, and it would have been relatively easy to respond, as also to allegations with regard to later fighting, since by then we also had the harsh but unbiased report issued by the Jaffna University Teachers for Human Rights, which recorded some remarkably decent behavior of Sri Lankan troops even in the height of battle. By then however the discourse had become more dramatic, and I fear the Americans may have contributed to suspicions that made us hesitant to treat their Report in good faith, given what seemed the flirtation of some of their number with Sarath Fonseka. Be that as it may, we were precluded then from responding even to what seemed the most serious allegation they recorded, namely that Sarath Fonseka ‘stated that the military had to overlook the traditional rules of war and even kill LTTE rebels who came to surrender carrying white flags’. Astonishingly, assuming one did not know what their agenda was, the Darusman Panel does not cite this allegation. They have obviously done their homework, for they even cite, misleadingly, something I wrote early in 2009. I cannot then believe they were not aware of the State Department Report, and its reference here to an alleged claim by a senior Sri Lankan official that the military committed a war crime. The Panel claims that ‘the Government gave several different accounts of the incident’. What it means by this is not clear. I cannot myself recollect any account by Government of what if anything happened, unless this statement by Sarath Fonseka while he was Chief of Defence Staff is considered. The web account of that statement also included the claim that it was people in air-conditioned rooms who wanted to accept the surrender, but he himself had put a stop to this. In December however he claimed the opposite, which was that it was people in air-conditioned rooms who had done the killing – though it should be noted that, if not quite cleanly, that allegation too was subsequently withdrawn. If Sarah Fonseka is considered a credible witness, then surely this must be the strongest evidence for an allegation of war crimes, a statement by someone with command responsibility. But given the political compulsions of the Panel, we can see why this particular bit of evidence had to be forgotten. This element becomes the more worrying in the face of credible allegations that the current Political Affairs Officer of the American Embassy has been trying to persuade army officers to provide evidence against the Sri Lankan government, with inducements such as access to residence in America. This amounts to bribery, but we know perfectly well that moral scruples have never applied with regard to foreign relations, and this cynicism is not confined to America. Instead of getting indignant therefore about the potential criminality of such efforts (America being one of the few countries that is in theory strong on bribery and corruption with regard to overseas contracts), we should try to understand what makes characters like this tick. Sheer hostility to Sri Lanka is not an answer we should be satisfied with, even with strong inferences that he is influenced by much stronger Sri Lankan personalities with dangerous axes to grind. Rather, we should consider why someone in theory concerned with human rights, in practice devoted to advancing American interests, should engage in what seems to us such sinister behavior. The answer may lie in reports that, while he wants a war crimes trial, he believes that we can plead innocence given all the mitigatory factors. I was wondering then whether what has not got the proverbial American goat – or perhaps donkey, given that the Democratic Party is now in power, and feeling slightly diffident about the war in Iraq that it has inherited – is our claim that we conducted a more humane operation than others engaged in fighting terrorism. This occurred to me when, several times, I was reproached by people who said that we had claimed there had been no civilian casualties. This is untrue, as would be the claim that our firing had caused no civilian casualties. I do not think anyone intended to give that impression, but I think the fear that we would be accused of causing civilian casualties deliberately led people to counter such claims more dogmatically than was credible. Given the massive civilian casualties American efforts in Afghanistan and Iraq and elsewhere have led to, albeit with few exceptions they claim that these were not intentional, it seems that, like the proverbial fox that lost its tail, they want us to get into the same boat. 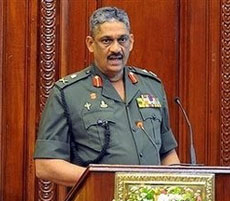 Ironically, while I have no doubt that our policies were very clear, and utterly decent, it would seem that any exceptions would have been because of what might be termed the Sarath Fonseka mentality, as indicated in the speech the Americans referred to before they decided to use him for higher things. 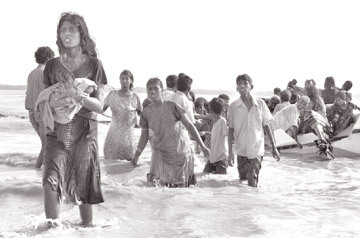 There is even an argument that the humane strategy the forces had decided on was changed, when he insisted on the techniques Daya Ratnayake had used so effectively in the East (which resulted in no civilian casualties except in one instance when the LTTE fired mortars from amongst civilians) being changed. The army which had become expert in moving in such a way as to cut off and thus rescue groups of civilians in small areas thus became a surrounding noose rather than a precise surgical tool. To make matters worse, Sarath Fonseka seems also to have resented the sending up of supplies. Though government did its best, and managed to send adequate food and vast quantities of medical supplies, including emergency kits, he was reportedly very harsh on those who ensured that such arrangements were carried out. In this context government has not made enough of the fantastic work done not only by the Commissioner General of Essential Services, but also by the navy personnel who ensured that essential services could be maintained, despite difficult conditions. With regard to the Channel 4 video, the Panel makes no reference to the arguments that the video was doctored. It is true that UN Special Rapporteur has tried to rebut these, but his Experts too grant that there are elements in the video that cannot be explained. The Panel also fails to note contradictions in the Channel 4 presentation of the video and what it claims is a continuation of the scene which was shown on December 2nd 2010, on which occasion the scene was dated differently from what had been put forward in August 2009. The second paragraph in the Darusman Panel Report that seems also to relate to the Channel 4 video introduces someone described as ‘the boy’, a use of the definite article suggesting what much of the Report indicates, that it is a cut and paste job using information supplied by nameless and unreferenced sources. That paragraph ends with an account of a video that ‘shows a young man who has been tied to a tree and is covered in blood. He later appears dead, lying in a grave covered by a Tiger flag’. I find it odd that, if this young man was indeed killed by the Sri Lankan military, they should then have placed him in a grave and covered him with a Tiger flag. I do not know if the Panel, which asserts elsewhere of insulting behavior to the dead, believes this was supposed to be an insult, of if they thought it necessary to record this touching instance of respect for the dead. It is also possible that by this stage they have ceased to believe in their own rhetoric. Certainly Sri Lanka should recognize that in any army, as in any institution, there are individuals who behave badly. While I was not privy to the language Sarath Fonseka used while in the field – and we should not allow his defects to blind us to his capabilities as a commander – the language he used on political stages suggests a mindset that saw physical violence as the answer to all problems. Given his successes in the field, there may well have been soldiers who saw him as role models. Ganeshapillai was among civilians advancing towards the army line in Iruddumadu. Four LTTE cadres joined the civilians and kept firing, deliberately provoking the Army. A group that had gone ahead of them had told the Army that more civilians are following along the road. The Army kept shelling but was then careful not to shell the road. As they got close, the four cadres ran back and turned into snipers. As the Army was receiving the civilians, the snipers opened fire killing four soldiers. But the other soldiers betrayed no signs of reacting against the civilians. They calmly carried their dead, loaded the civilians into tractor trailers and sent them on. The LTTE seemed to pin their hopes on ensuring maximum civilian casualties, in the hope that Uncle Obama would intervene. This makes it clear what the policy was. It is inconceivable that the army itself cared nothing about inflicting civilian casualties, and that soldiers disobeyed policy and spared civilians, at risk to themselves. However, obviously the converse could have happened, ie that civilians were not spared, not because they were deliberately targeted but because boys in fear of their lives will act in self defence instinctively. Given the relentless animosity of the Darusman Panel, it is not surprising that they did not consider the findings of the UTHR Report. That is certainly not positive about the government, but as I have argued before, given the lack of bias of UTHR, we should engage with them and take their findings seriously, even if we do not agree with them, and think some of them erroneous. They are certainly amongst the few agencies willing to admit it when they get things wrong, and we should treat them with respect. The ICRC had in fact asked the LTTE not bring their vehicles and weapons near PTK Hospital, but to no avail. Some of the hospital ambulances had also been taken over by the LTTE, whose leaders were using them to move around. The principal described something else he had seen. 15 escapees had been shot dead opposite the Putumattalan Hospital. Along with the daily quota of dead resulting from army shelling, these bodies too were placed in a space ringed by ropes on a side of the hospital. With the help of labourers, the doctor looked at the bodies and pronounced the cause of death. The distinction was clear between shell injuries and bullet injuries. The doctor regularly pronounced all of them to have died due to army firing. The principal remarked, “I wonder how he did it?” This went on day after day and perhaps above a thousand died trying to cross the strip of water. 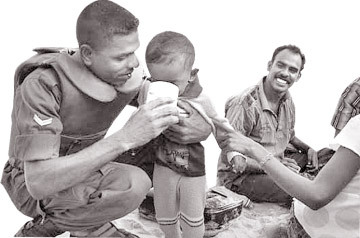 A senior officer who lost close relatives due to army shelling, and is just coming out of a prolonged depression, blamed the LTTE for much of the suffering and said emphatically that the LTTE fired shells on civilian institutions such as hospitals. A woman officer came out even more strongly. She recounted angrily the violence used by the LTTE during conscription, dragging people out of bunkers, beating them along with their parents and shooting those who followed the abductors pleading and protesting. ..
Generally, people were angry and so negative about the LTTE that they were quite ready to say and believe that many cases of civilian places being shelled were the work of the LTTE. One man said that the LTTE would fire two shells at civilians from Chalai and then two shells at the Army, provoking it to fire at the civilians, so that the people would blame the Army. He was very positive that the shelling of PTK Hospital was by the LTTE. Once the Army controlled parts of the bund, about 7.00 AM, soldiers at certain points showed white flags, signalling the civilians to exit the zone at those points. Soldiers helped them to scale the bund and instructed them to lie low and move when they told them it was safe. They also saw the dead bodies of many who had perished from the fire of one party or the other. At the same time, LTTE cadres who had withdrawn east away from the bund started firing at the soldiers with small weapons and RPGs. In this exchange many civilians too were killed. Such stories do not figure at all in the Report of the Panel, making it clear that the LTTE strategy on promoting civilian casualties is now proving useful to a host of other enemies of a pluralistic Sri Lankan state.